Thanks to everyone that attended my session at SharePoint Saturday Twin Cities in Minneapolis on April 6/19! You can find my presentation slides below, and should be able to download them from SlideShare. 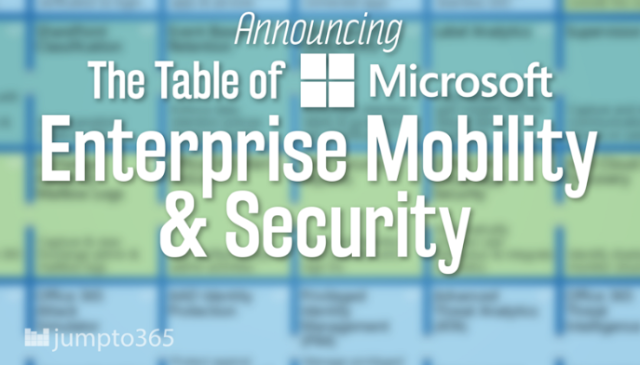 This session had a lot of information to in it, walking through the various components that make up the Microsoft Enterprise Mobility + Security offering and the licensing options around those offerings. Azure Rights Management (part of Azure Information Protection) and the Windows Server CAL rights. You can find more information about Microsoft Enterprise Mobility + Security licensing here: https://www.microsoft.com/en-us/enterprise-mobility-security/compare-plans-and-pricing. There are other licensing options as well, but these are the primary ones that organization consider when they look to increase the security and compliance features which their organization is leveraging. 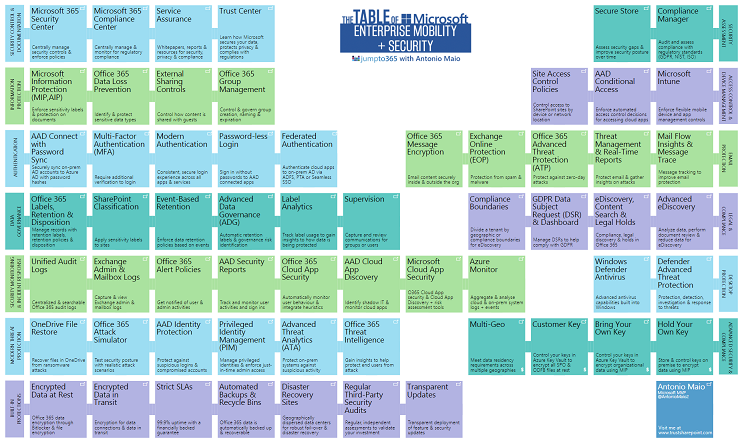 You can learn a lot more about each feature included across all Microsoft Security and Compliance tools from our Table of Enterprise Mobility + Security. The features and tools are grouped together to identify the tools that help you to accomplish specific related tasks, and clicking on each tile in the table will take you to the Microsoft documentation which is specific to that service or feature.